In ASI's January Tech News you will find several products that will address Power Supply and associated products types of applications. ASI products offer the utmost in performance and reliability to the end users. Furthermore, these outstanding products are extremely cost-effective when compared to competitive models in the market. Please review the information contained herein and contact an ASI Product Specialist to assist you in the selection process. Premium Selection - Power Supply with Integrated Battery Charger. These power supplies can feed a load while simultaneously charging batteries. The alarm contact and front panel LED will alert the operator if there is a problem. Each power supply has battery protection and a deep discharge protection circuit. 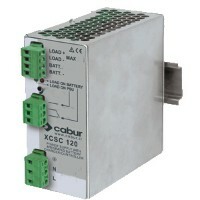 Both power supplies have 160% overload capability for inductive load applications. Incidentally, these products are used internationally due to the wide range AC input of 90-264 Vac. With an efficiency rating of >90% you are guaranteed to have a highly reliable power supply for the life of your product. Both power supplies along with the new line of DC UPS and battery charger modules support your applications where battery backup is being used. Offers Space & Dollars Savings Not to be Ignored! are presented. 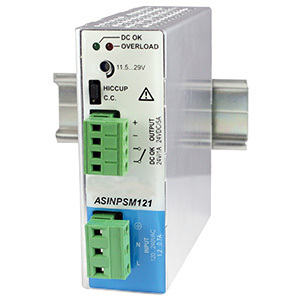 ASINPSM121-24 is an extremely versatile DIN Rail mountable unit that is single phase, with an input voltage range of 120-240 Vac/110-345 Vdc. Our ASINPSM121-24 model includes output rating of 24 Vdc and includes an adjustable range from 12 to 28.5 Vdc. The adjustable output range offered on this high efficiency power supply covers what would be required by using three separate power supplies. that is available in the same compact size to fit those tight fits. ASI's DIN Rail DC-UPS is a Dependable High Performance Device Choice, when you Seek a Cost-Effective Solution in your Applications! ASI's ever expanding product portfolio now includes the ASIDCU20. 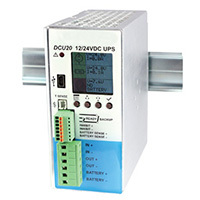 This device is a programmable DIN Rail DC-UPS with Integrated Battery Charger. In modern industrial environments, automation systems systematically and accurately control the workload and workflow at the facility. In the instances of power failures, an extremely critical aspect in maintaining reliable data and results is to preserve the integrity of the automation system. By utilizing a dependable back-up DC-UPS, you can avoid costly system and machinery downtime. Process controls and communications channels will continue without interruption until the breach can be identified and rectified. ASI's Stocks DIN Rail Styles & DIN Rail EZ Bench Top Cutter, Offering ONE-STOP Shopping to Meet your Application Needs! When you are considering DIN Rail mountable products such as the power supplies listed herein, look no further for DIN Rail to mount those components inside of your enclosure. ASI stocks a full array of steel DIN Rail styles to meet your various requirements. The most commonly used DIN Rail is slotted 35 mm x 7.5 mm. ASI offers this type in 1-meter (PR005-1M) and 2-meter (PR005) precut lengths. 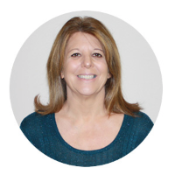 Please feel free to contact one of our product specialists to discuss your panel or enclosure applications and the use of DIN Rail to mount your components. If custom sizes of DIN Rail are required, ASI has you covered. ASI's EZ DIN Rail Cutter (ASI305001) will cut all standard types of steel DIN Rail that may be specified in your operation. Improve productivity in the production area and consistency in results of your custom sized, fit to order DIN Rail. EZ DIN Rail Cutter incorporates a built-in ruler and end-stop that allows you to accelerate your repetitive burr-free cuts in accurate lengths resulting in productivity improvements and cost savings. Reduce your in house inventory of wide variations in lengths of pre-cut DIN Rail for the array of requirements that your production area may be supporting. And your production staff will be pleased to know they are using the safest cutting tool of its kind. When you select ASI EZ DIN Rail Cutter you will reap additional savings in your operation. Feel free to contact ASI to review your application requirements and offer solutions that will meet your needs every time! Call 877-650-5160 for more information.